X-Payments Connector is an add-on module for X-Cart that provides an interface for an X-Cart based online store to connect to and process payments via X-Payments, a PCI DSS Level 1 service provider. Below is a video tutorial on how to connect X-Payments 2.1 or later with X-Cart 4.6.4 or later. The video features the X-Payments connector modules for X-Cart 4.x Classic released in September 2014. 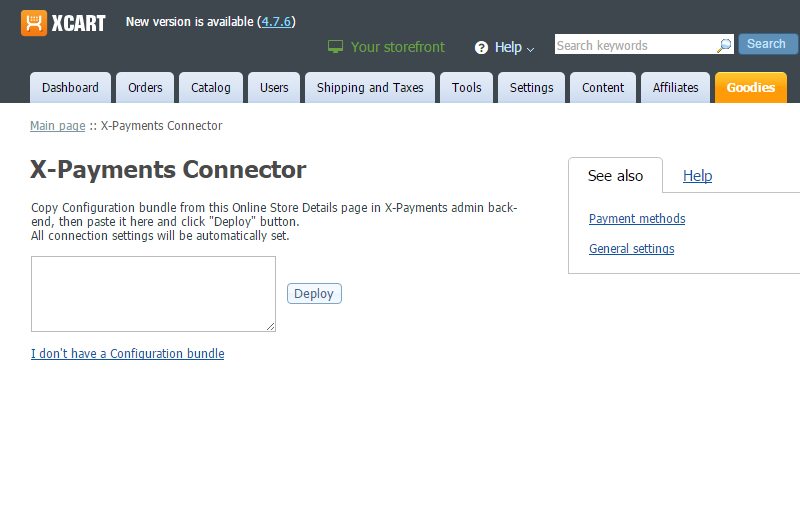 In the Online Stores section of X-Payments (Settings->Online stores), add and configure an online store that will represent your X-Cart store in X-Payments. The payment method for accepting payments via X-Payments will be created from this very configuration. Make sure the payment configuration is active ("Enabled"). In the details of the online store you have configured in X-Payments, specify that the store will be using the payment configuration you have created and configured at the previous step. Make sure the store is active ("Enabled"). 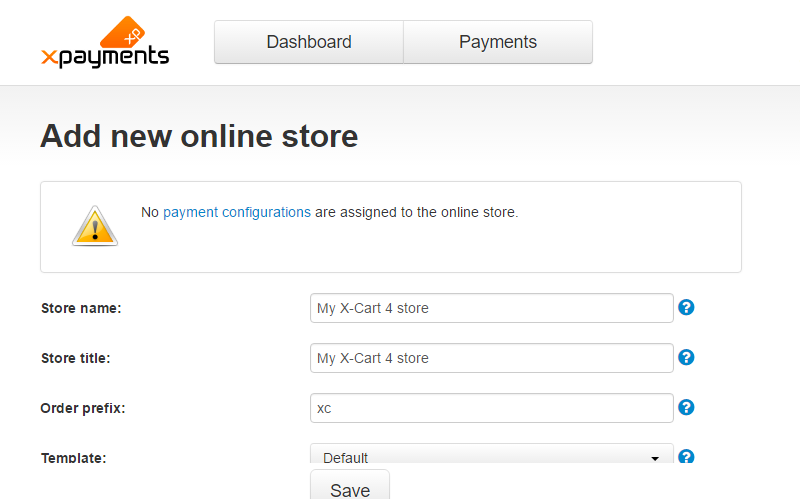 Click on the name of the store you have configured in X-Payments to access the store's details. Here you will find a section titled "Connection". 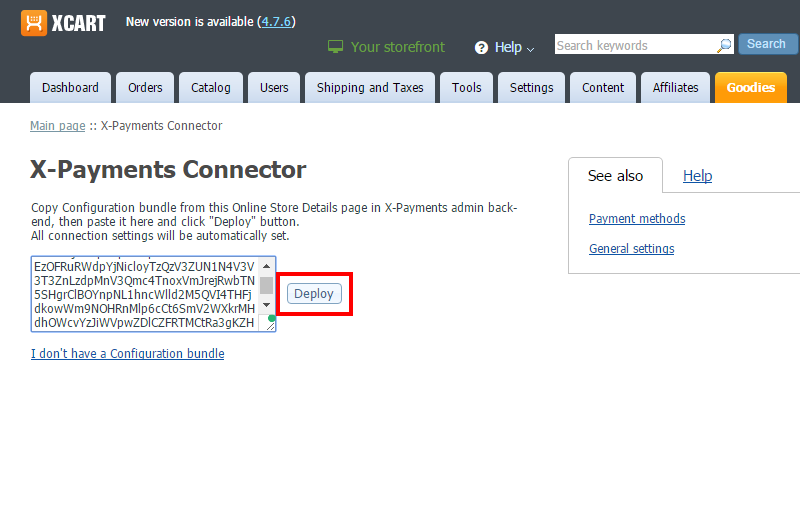 This section contains the configuration bundle that you will use a bit later to automatically deploy your X-Payments connection details in X-Cart. For now, leave the X-Payments page with the configuration bundle open and go on to the next step. Click the Configure button next to the module name to access the module settings. 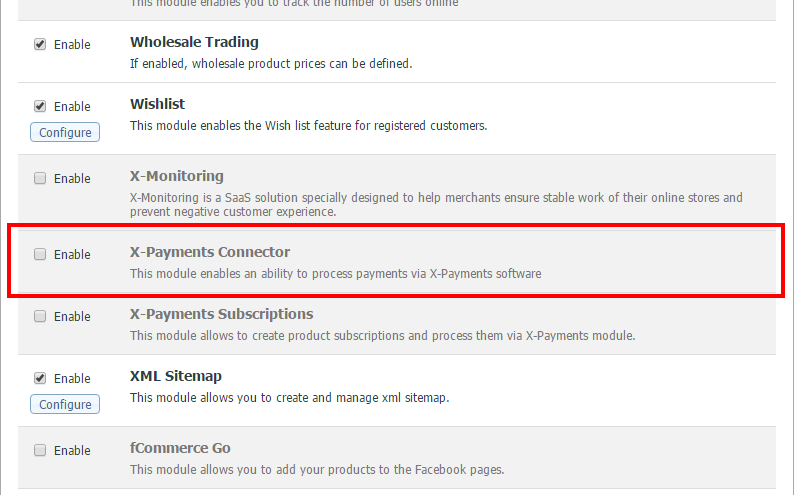 The module settings can also be accessed by selecting Settings->X-Payments Connector. Here you will need to configure your store's X-Payments-related settings. As a result of synchronization, any payment methods added, updated or deleted in X-Payments will be added, updated or deleted, respectively, in X-Cart. Be sure to save your changes by clicking the Apply changes button. If you wish to allow your X-Cart store users to save their credit card in their front-end profile, adjust the settings on the Save credit card setup tab; be sure to save your changes by clicking the Apply changes button. Note that at least one active X-Payments payment method that supports "recharges" is required to use the save credit card feature. Enable save credit card feature: Select this check box to enable the save credit card feature for your customers. With this feature enabled, your customers will be able to save their card in their front-end profile. Set a payment method for saving cards: Select the payment method that you want to be used by customers who choose to save their card. Comment: When a customer chooses to save their credit card with your store for future payments, you need to run an authorization against their card to have the card details saved by the payment service provider and to obtain a token that will later need to be submitted for any future authorization/charge requests for that customer to use their card for payment. The payment method selected here will be used for such authorization transactions. Authorization amount: Specify the small sum for which your store will request an authorization when saving a customer's card. Comment: By default, a zero value authorization is used on the customer's card when a card is being saved. However, some payment service providers do not support zero value authorizations. If this is the case with the PSP you intend to use for card saving, adjust the authorization amount value in the "Authorization amount" field according to the requirements of your PSP so you can obtain non-zero value authorizations. IP addresses for X-Payments callbacks (optional): Enter a comma-separated list of IP addresses from which your X-Payments callbacks will originate. Comment: X-Payments will send callback requests to your store from specific IP addresses. To ensure that your store accepts callback requests only from these IP addresses, specify the allowed IP addresses here as a comma-separated list. Note that the address "127.0.0.1" may not be used here. 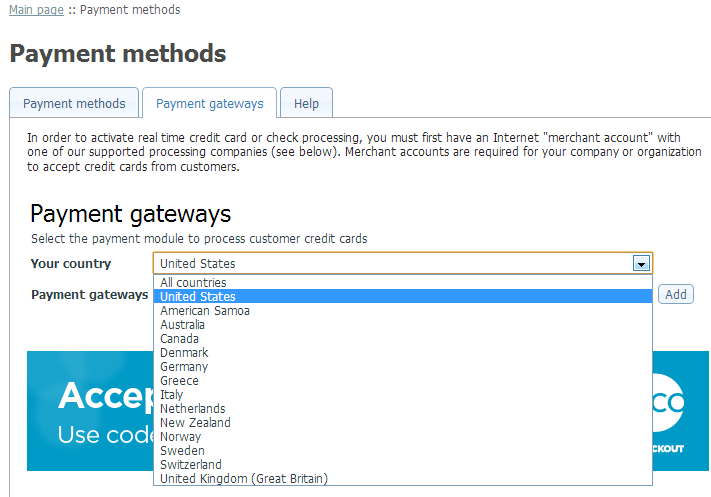 For a better understanding of what IP address(es) to put here, see Callback from X-Payments to the store. Use iframe: Specify whether the X-Payments credit card form should be embedded in your X-Cart store's checkout via iframe (available with X-Payments 2.1.0 or newer). Payment currency: Specify the currency that should be used for all payment transactions via X-Payments. IMPORTANT NOTE: If you are using a new X-Payments version and an X-Cart version newer than 4.6.3, please read the above section. XML DOM extension, to parse XML data (or DOM extension for PHP 5.x). Note: X-Cart versions 4.4.x and later already have theX-Payments Connector included into the distribution package. For these versions, you do not need to install the module - just enable it on the "Modules" page and configure it to work with your X-Payments installation. 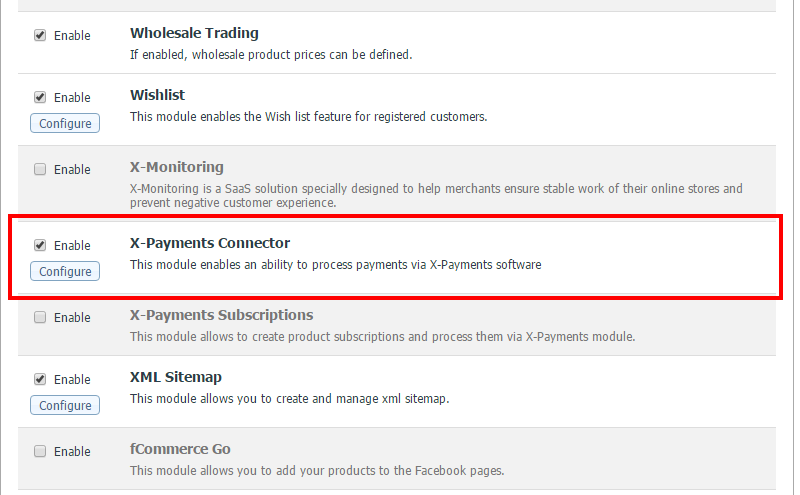 Before you can start using X-Cart together with X-Payments, you must configure the X-Payments Connector. 2. Go to the Modules section (Administration menu -> Modules). 3. 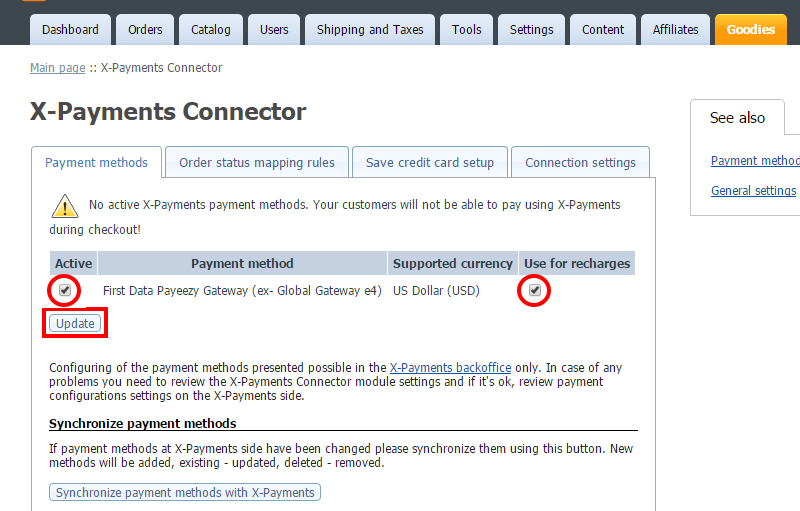 If not selected, select the check box for the X-Payments Connector and click Update. This will activate the module. 4. 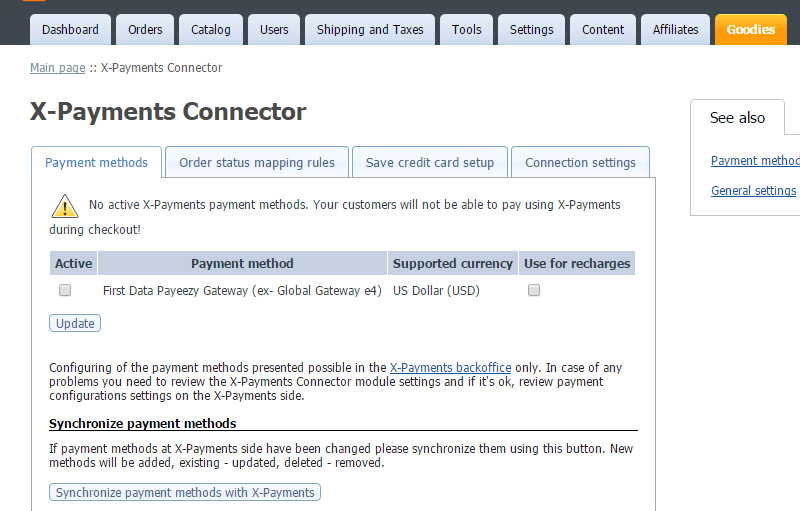 Click on the Configure link for the X-Payments Connector module. Copy the value of the Configuration bundle field from the X-Payments' Online Store Details page, paste the string here and click Deploy. All the connection settings will be automatically specified. 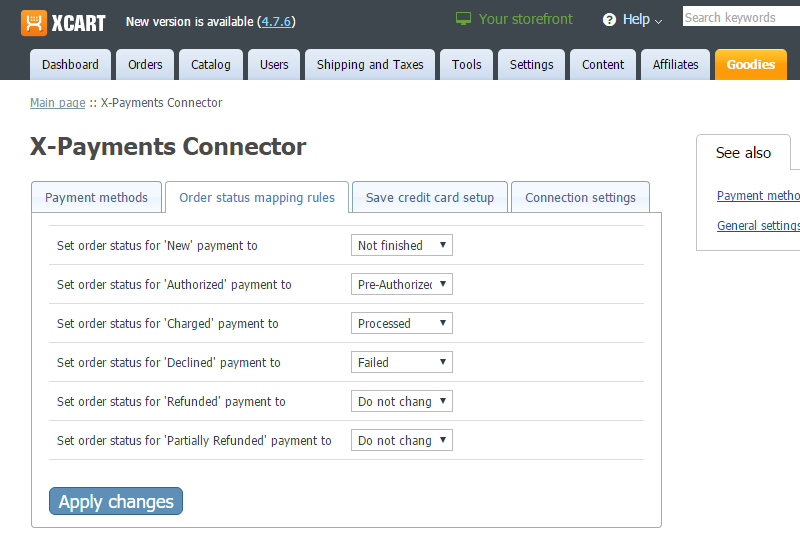 The latest versions of X-Payments Connector can automatically get connection settings from the settings of the store. In the older versions, the values are to be specified manually. Store ID: Unique value generated in the X-Payments back-end for a particular store. This value allows X-Payments to correctly identify requests coming from this store. X-Payment URL: The URL of your X-Payments installation. Make sure the URL is specified correctly, otherwise the module will not be able to connect to X-Payments. Encryption key: A key to encrypt requests that the store sends to X-Payments. The key is generated in the X-Payments back-end. Decryption key: A key to decrypt responses and callback requests that the store receives from X-Payments. The key is generated in the X-Payments back-end. Decryption key password: A password to decrypt the Decryption key. The password is generated in X-Payments back-office. 6. Set the mapping rules you require. The mapping rules are used to synchronize the transaction statuses in X-Payments with the statuses of the respective X-Cart orders. To associate an X-Payments transaction status with an X-Cart order status, choose the order status from the drop-down box in the column on the right. 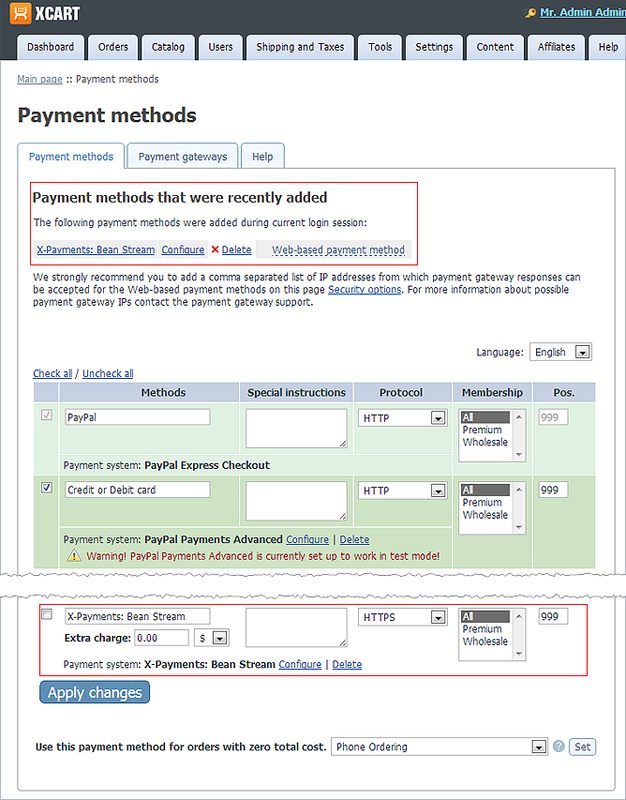 For example, if you associate the entry "Set order status for 'Charged' payment to" on the right with the value "Processed" from the drop-down box on the left, changing the status of an X-Payment transaction to "Charged" will automatically change the status of the respective order in X-Cart to "Processed". To test the module settings and connection with X-Payments, click the Test module button. 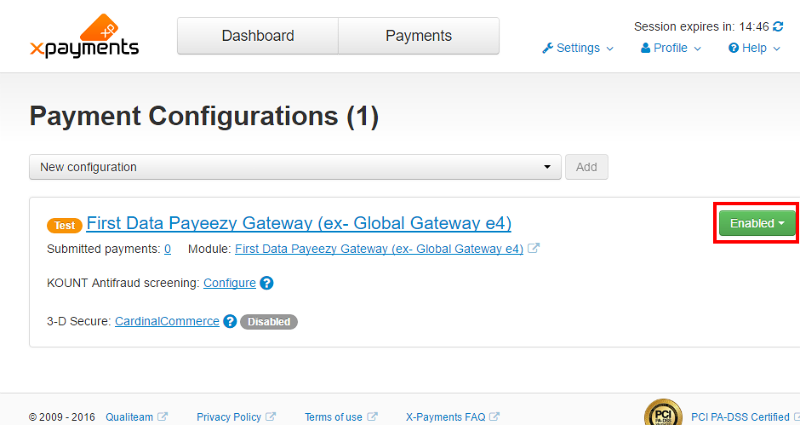 If the module is configured properly, a 'Test transaction successfully completed' message is displayed at the top of the page. To be able to use the payment methods defined in X-Payments you should import information about them from X-Payments. First, click the Request payment methods from X-Payments button, and X-Payments will return a list of payment methods available for this shopping cart. 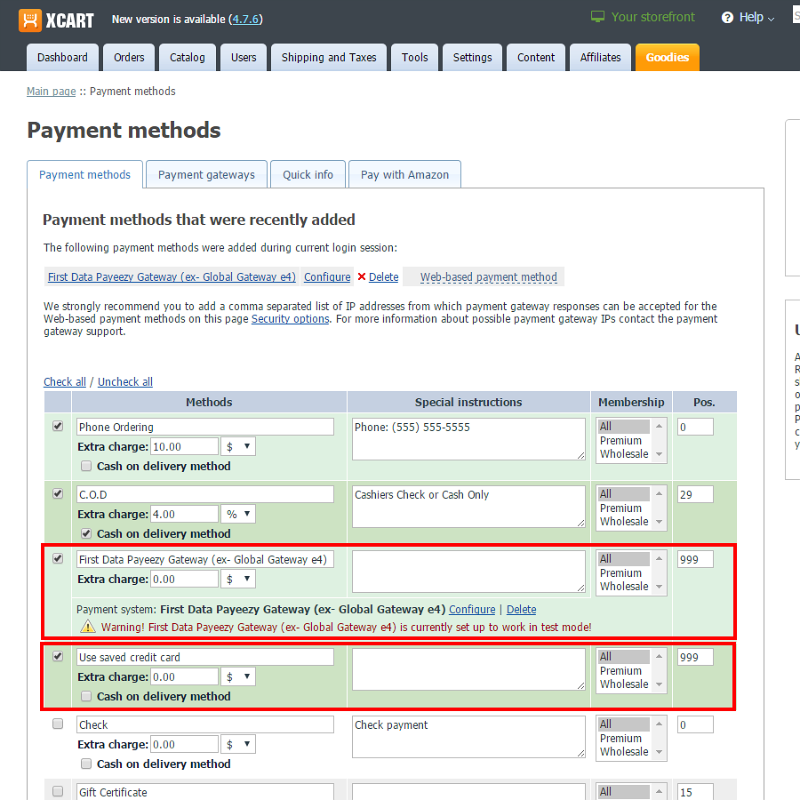 After you have reviewed the list of available payment methods, click Import payment methods and proceed with the next step - adding and enabling X-Payments payment methods in X-Cart admin area. Please note that if you have already imported payment methods from X-Payments earlier, all previously imported payment methods will be removed from the "Payment methods" list in X-Cart if you select to import payment methods again. 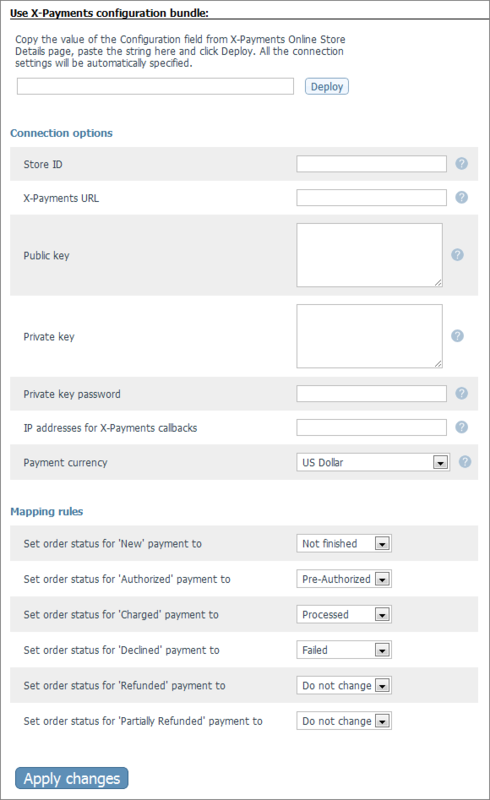 In this case, you will have to add and enable X-Payments payment methods in X-Cart admin area once again. 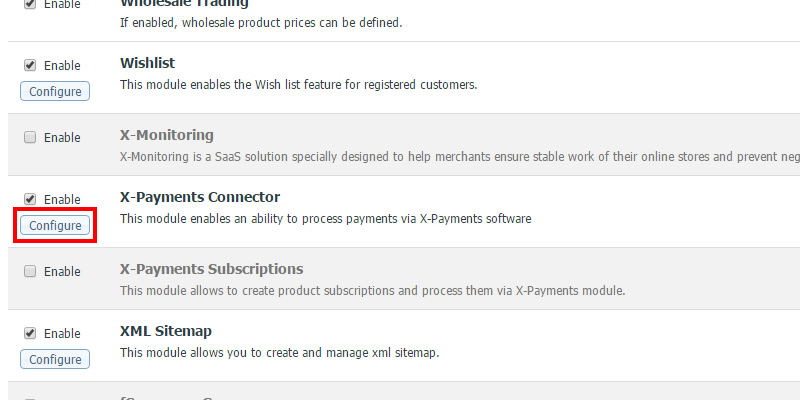 To be able to use X-Payments payment methods, you need to add and enable them in X-Cart admin area. Note: If you are looking to set up PayPal's payment methods via X-Payments in your X-Cart store, please proceed with the special instructions for adding and enabling PayPal payment methods in X-Cart, and skip the instructions below. Otherwise, in case you're looking to set up other payment methods like Authorize.Net AIM or PayflowPro, please proceed with the instructions below. Note: As PayPal requires a special configuration process as noted above, PayPal's payment methods imported from X-Payments will NEVER appear in the "Payment Gateways" list under the "X-Payments payment methods" section. Do not worry about it - you will see them when following the special PayPal configuration instructions as noted above. 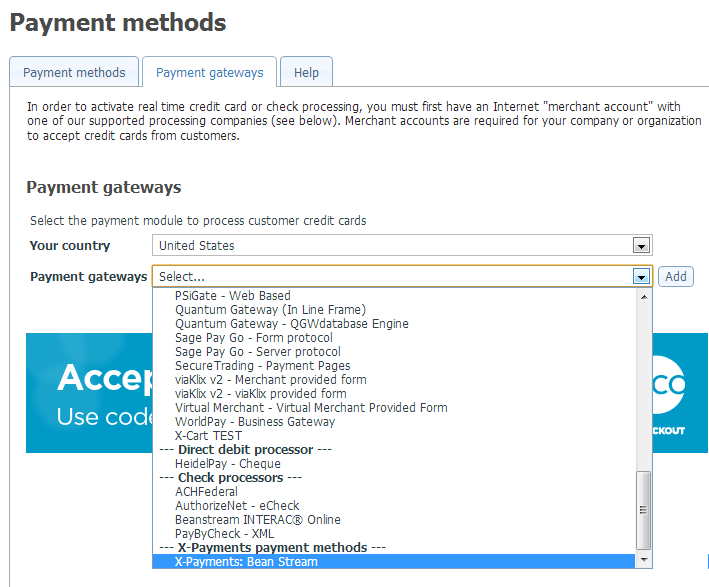 In the Admin area of your X-Cart store, go to the Payment methods page (Settings->Payment methods). Click Add. The payment method will be added. You can check its configuration by clicking the Configure link opposite its name. 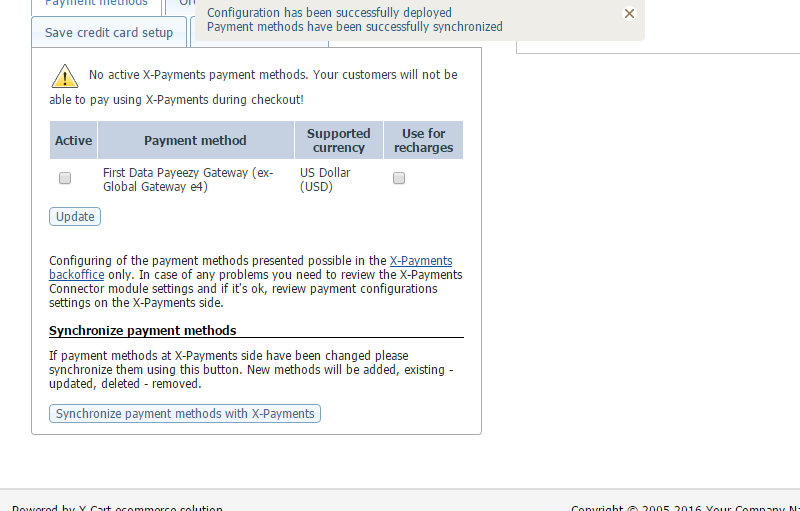 Note that for X-Payments payment methods it is not possible to change the configuration using X-Cart's user interface. Should you need to change anything, you will have to make the changes in X-Payments and then import and add the method in X-Cart again. Locate the payment method you have added in the list of payment methods. You may need to scroll down the form because new methods are added to the end of the list. Select the check box to the left of the payment method name. Click Apply changes. The payment method will be activated. 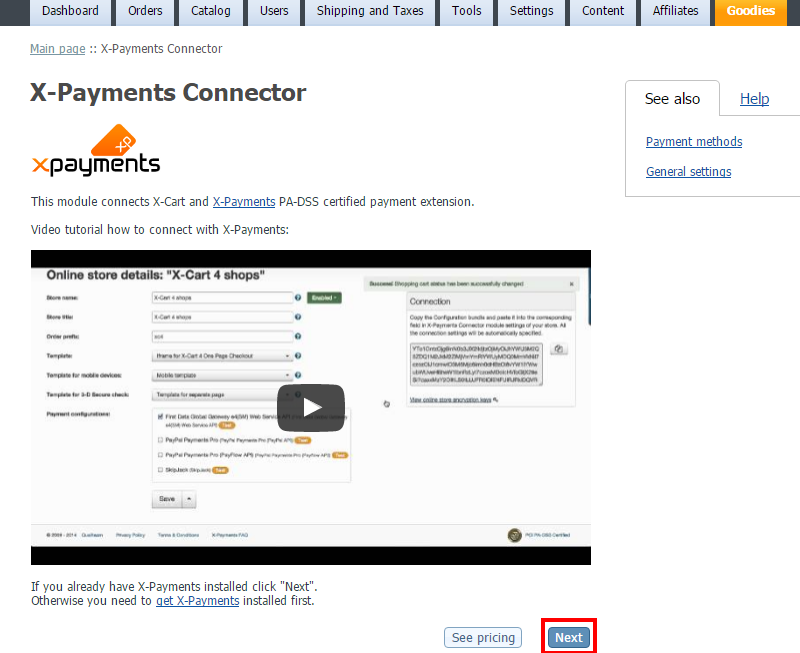 You can edit or delete the added X-Payments payment method like any other payment methods in X-Cart. 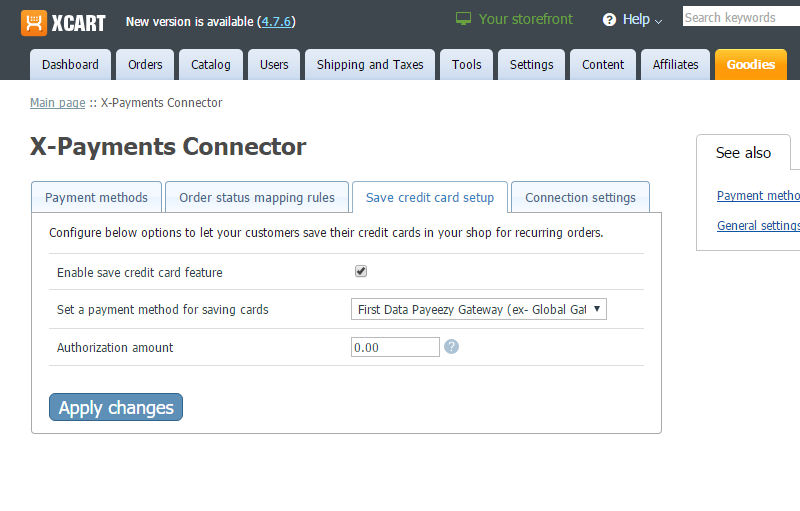 An online store based on X-Cart version 4.1.9 (or later) and connected to X-Payments version 1.0.6 (or later) with one of the latest versions of the X-Payments connector can be configured to display the secure X-Payments generated form for entering payment card information directly on the checkout page in X-Cart - as opposed to the mode in which this form is displayed on a separate page. For the buyer everything looks as though they were entering their credit card details within your regular checkout routine. Embedding the form generated by X-Payments into X-Cart's checkout page is made possible by use of iFrame. iFrame integration for X-Cart&X-Payments checkout routines is part of the X-Payments connector functionality, so it is essential that you should use an up-to-date version of the connector to enjoy this feature. Older versions of the connector (released prior to September 2014) do not support the iFrame feature, so if you last updated your X-Payments connector for X-Cart prior to September 2014, or purchased your X-Cart prior to September 2014 and continue to use the built-in X-Payments connector that came with it, you must update your X-Payments connector be able to use the iFrame feature. 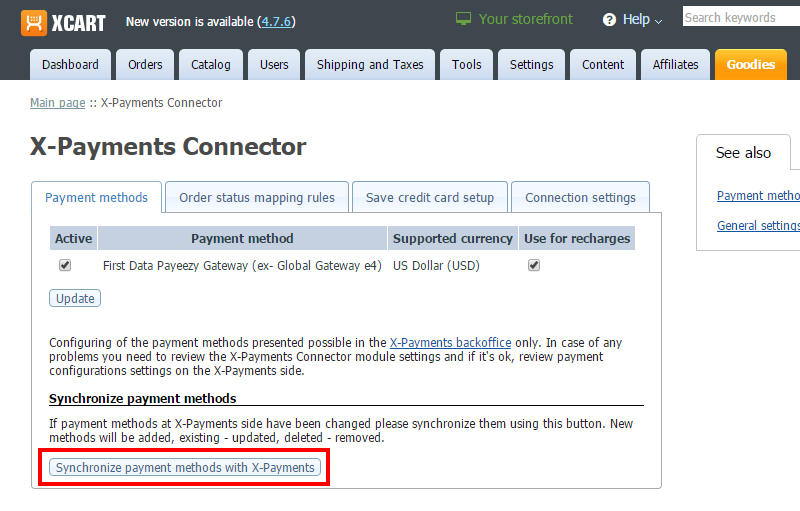 Newer X-Payments connector versions (released after September 2014) already include support the iFrame feature, but we still recommend updating to the latest connector version available to ensure that your connector has all the latest features and fixes. In your X-Cart store's Admin back end, go to the X-Cart Connector settings page and enable the "Use iframe" option (If you are using an older X-Cart versions, this may be called "Use lite interface"). Make sure the "API version" field on the same page is set to "1.2". In your X-Payments Admin back end, go to the Online Store Details page for your store and enable the "lite" template there.